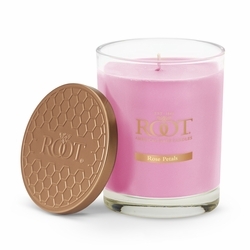 Root pays homage to the queen bee with the beautiful new Hive Jar Candles. With 16 oz. 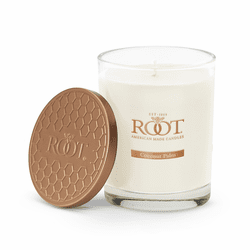 of Root�s famous natural beeswax and essential-oil blend, the candles offer a luxurious, clean-burning experience in an elegantly designed glass jar. The Hive candles are replacing Root�s Queen Bee candles, which have been discontinued. Upcycle Tip - When your Hive candle has finished burning, wash the empty glass jar and use as a fresh herb or flower vase. Five-petaled blooms perfume the springtime air with the beautiful aroma of juicy green apple, gardenia and white rose, with hints of musk and crisp woods harmonizing together to attract everyone�s favorite pollinator, the honeybee. A harmonious blend of creamy coconut and fresh coconut milk, with hints of exotic palm fronds and fresh coconut husks. Sour-sugared, fresh-bright lemon, clove and subtle lavender, together with buttery bakery notes, caramelized sugar and creamy whipped vanilla. Cool, aquatic marine notes blend with salted sea mist, amber salts, and musk for the perfect beach escape. 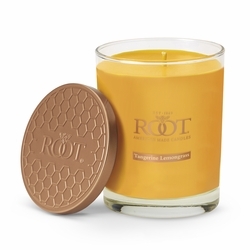 Notes of juicy peach and fresh verbena blend with notes of Neroli, sandalwood and hints of bergamot. Rich, warm baking cinnamon blends with clove, sugar cane, caramel and vanilla for a sweet cinnamon celebration. Fresh pumpkin, ground cinnamon and nutmeg, along with clove, ginger and pumpkin puree. Also infused with brown sugar, vanilla creme and musk. Ripe, sugared blackberry with sweet pineapple and mango nectar blended with macintosh apple, mandarin orange, white peach finished with bright plumeria blossoms and end on notes of sweet pea and sheer musk. 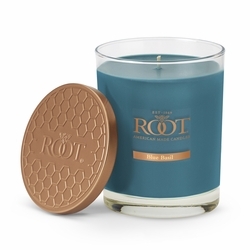 Freshly chopped, rich blue basil with a clean, fresh blend of greens with spicy notes of the surrounding garden herbs: Ginger, Clove and Eucalyptus, mixed with the pure notes of the tomato leaf. An uplifting burst of lemon and lime, highlighted by eucalyptus and sage. Golden Manuka honey drizzled with the sugary dripping nectar of Acacia petals, sparkling neroli, and frosted Sicilian bergamot. The true essence of the love affair between honeybees and blossoms. An earthy, true lavender essence of a newly blossomed lavender plant...clean, green, sharp blue lavender softened by chamomile, thyme and sheer musk. Classic, comforting scent of sweet vanilla bean on a custard background. A sensuous blend of ginger, cloves, mace and patchouli softened with geranium. Sandalwood and cedarwood, combined with the aromas of citrus, lavender and sage. The bright, fragrance combination or rich sage, jasmine, hyacinth and violet fragrances and the bright blossoms of lilac mix with the nourishing nectar of lilac. Tropical and sweet, the pineapple is unique in its pollination as the seeds, if not pollinated, actually damage the flowers. 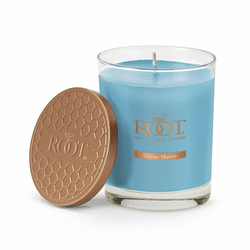 Combined with the heady scent of papaya, this fragrance will deliver you to the tropics. Top notes of sweet apple, peach and green leaf complement this rich, fresh cute, herbal fragrance. Distinctive blend of jasmine from the Philippines with honeysuckle and rose. Named after the French region where these special grapes are grown, Champagne has become the quintessential celebratory beverage. Notes of orange zest, peach nectar and ozonics complement the berry and pear subtleties. Candied citrus envelope the bright, effervescent fragrance of the grapefruit, warming the typically sour / bitter notes to the perfect combination of sweet / tangy to create the perfect grapefruit fragrance. A blend of citrus, grapefruit, bergamot, and lemongrass, mixed with orange blossoms and mandarin, added to cedarwood, musk, and vanilla. Intoxicating blend of rich green tea leaves swirl with notes of purifying bergamot and tart Meyer lemon to create the perfect cup of relaxation. An earthy combination of tobacco leaves, pine, patchouli, and oakmoss mingle with smoky notes of burnt caramel, sugar, and marshmallow. Juicy wild strawberry is the primary note of this succulent strawberry desert candle. Fruity notes of the luscious berry with spicy maple complimented by white cake, vanilla, and sweet cream.